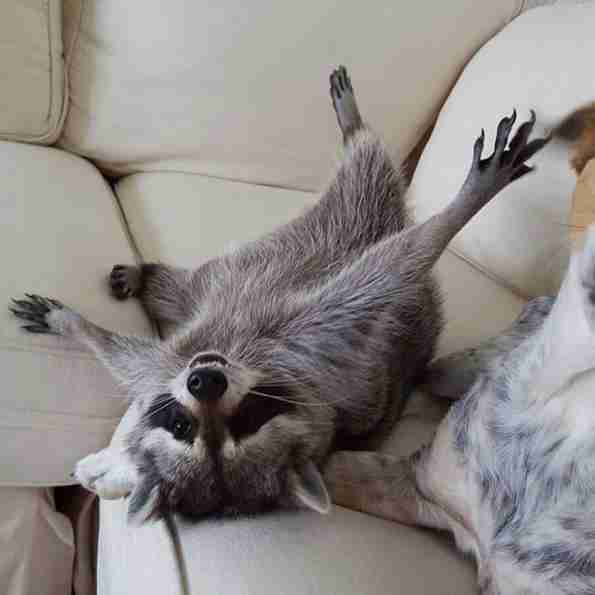 Late last year, a very unusual bundle fell out of a tree in Rosie Kemp's backyard: a month-old raccoon. She was very weak, and had broken her back leg. 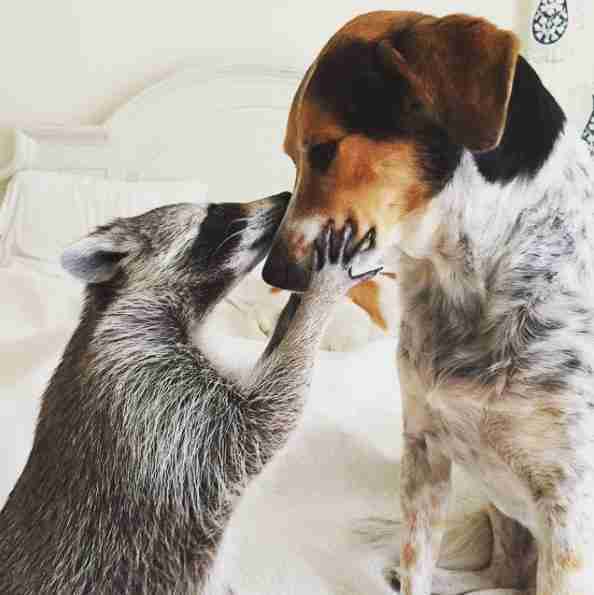 Kemp waited, but when the raccoon's mother didn't return she decided to take her in. 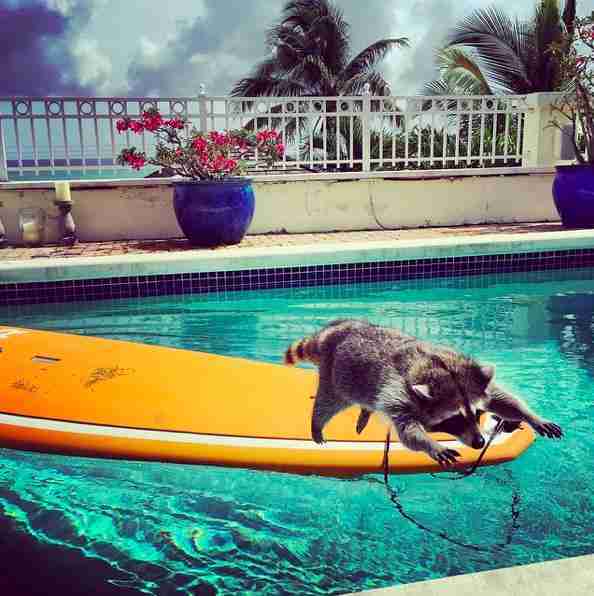 Kemp lives in Nassau, Bahamas, where there are no raccoon rescues and it's legal to own them. Determined to give the tiny cub her best possible chance, Kemp and her daughter, Laura Young, raised the little raccoon just like one of their own. They fed the cub, whom they named Pumpkin, every few hours round the clock and kept her warm and toasty, just like her mom would have. 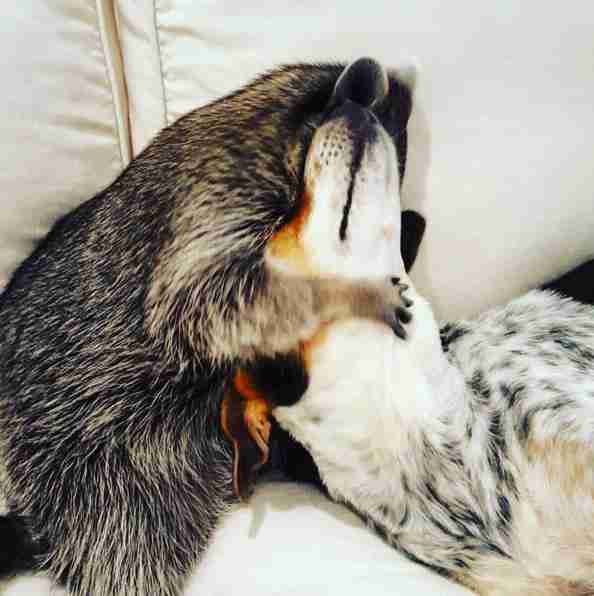 "Raising her was (and still is) a full-time job," Young told The Dodo. "They are so unbelievably intelligent, very aware, and I would say they are even able to express emotions." Now Pumpkin lives with Young, her husband, William, and their two rescue dogs, and appears to be as happy as can be. Her adventures are chronicled on her Instagram account, where Young and her friends post photos of Pumpkin's daily life. ... and cuddle up on the couch. She even likes to play by the pool. ... especially if it's food. And Pumpkin has no problem making herself heard. One morning, Young said, she was in a room with Pumpkin and the dogs when Pumpkin decided she wanted out. So she climbed onto a basket by the door and proceeded to try and open the knob herself. 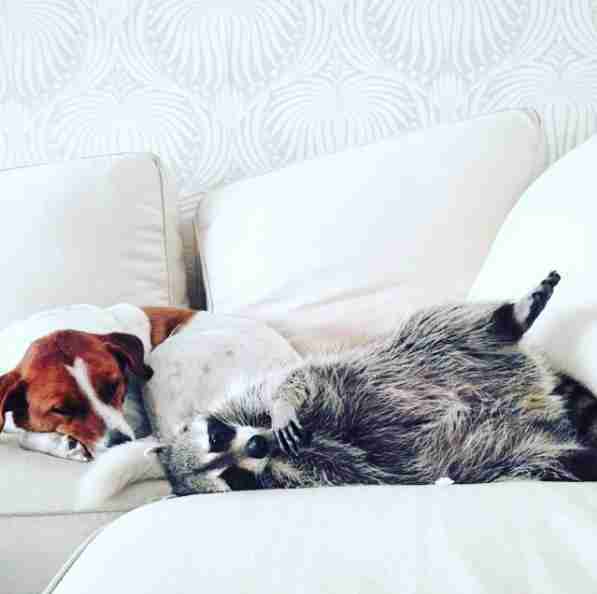 "Raccoons are NOT pets," Young explained. "They are wild animals, so they are quite moody. 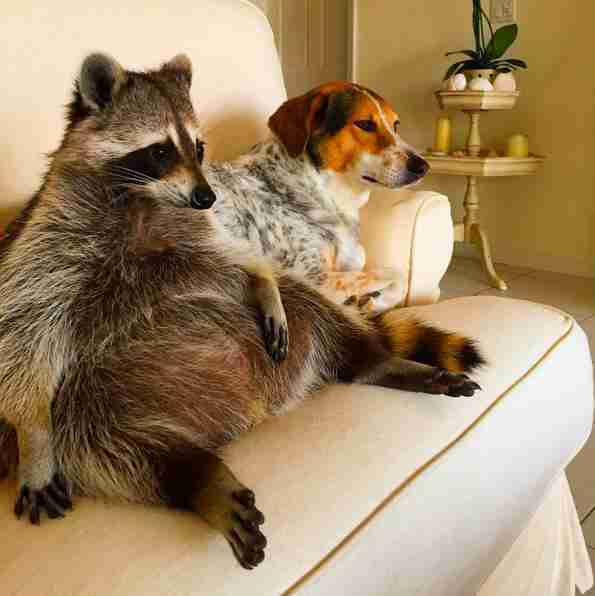 Unlike dogs and cats, they are not domesticated. Like a spoilt child if she doesn't get her way, she will let you know." 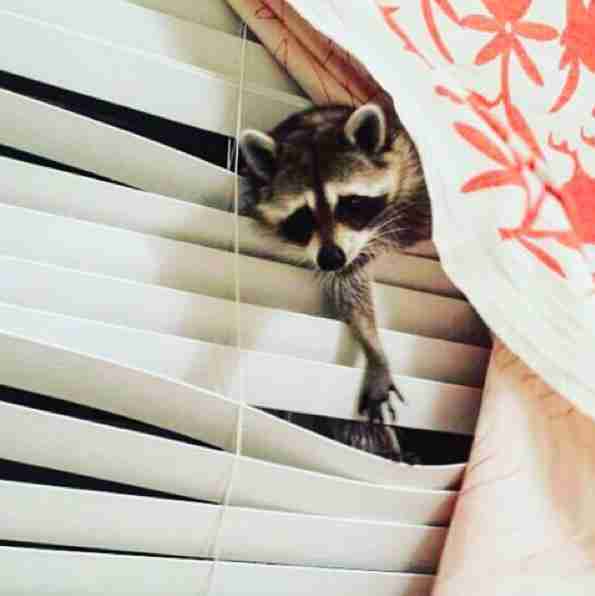 Raccoons, like all wild animals, belong in the wild whenever possible. But since Pumpkin missed out on that life, her family is devoted to making sure she has everything she needs to thrive. And she seems quite happy with it. Young said Pumpkin loves air conditioning, and feasting on treats like sunny-side up eggs and watermelon. She's even learned to use the toilet to go to the bathroom. 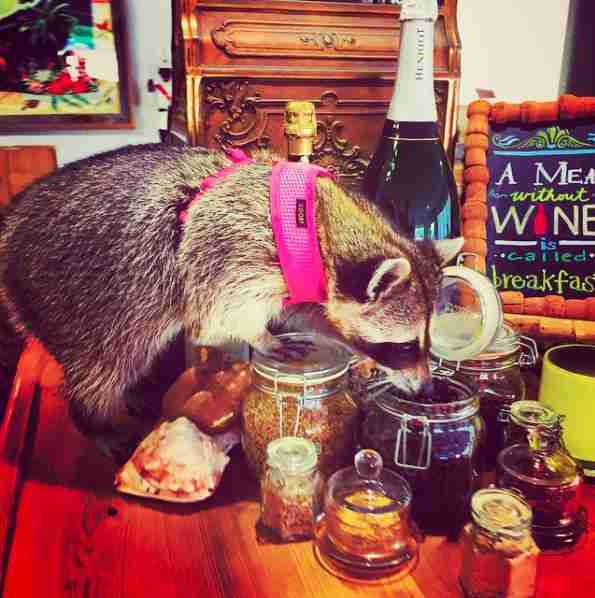 Thanks to Young and her family, the year-old raccoon has a home and a bright life ahead of her. And most importantly, she has people who will do anything they can to keep her happy - even if her life is a bit unusual. "We are very lucky with her and always want and will do what is best for Pumpkin," Young said. "But for now she is very happy with us and the dogs!" You can follow Pumpkin on Instagram, Facebook and Twitter. 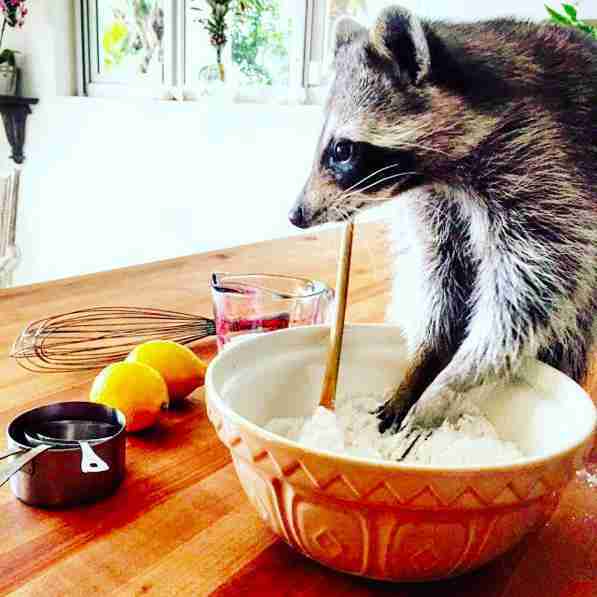 Note: Raccoons do not usually make good pets and are illegal or restricted in much of the U.S. 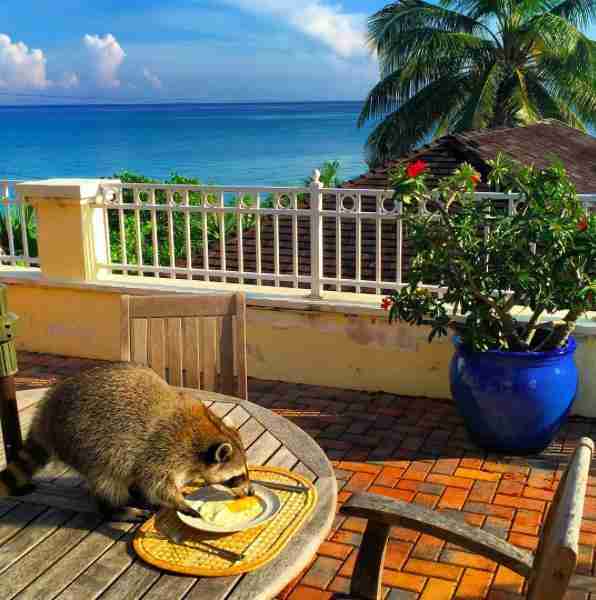 While rabies is not considered a threat to land animals in the Bahamas, raccoons in the U.S. are major rabies carriers, and if they bite someone will almost always be put down for rabies testing (which makes human contact dangerous for them). They are also extremely active, curious and destructive animals and, as with any wild species, do best in the wild whenever possible. 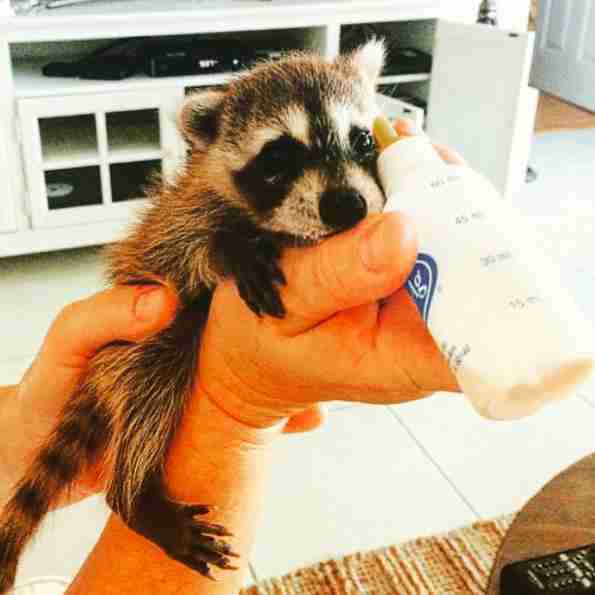 If you do find an injured or baby raccoon in the U.S., please contact your local wildlife rescue for help.